When replacing the tub in your home there are a lot of factors to take into consideration. We sell many tubs and showers at Alabama Mobile Home, many are pictured below. We will also go over a few of the more important things to consider when replacing the tub in your mobile home. Space – How much space is available in your bathroom for your tub or shower project. If you are replacing an existing tub or shower you will simply measure the width and length of the existing tub or shower. However, if you are modifying your bathroom you might want to go with a larger tub or shower combo. In this case, you want to measure the room where your future tub or shower unit will be going. Fit – Once you figure out the size you are working with you can now go on to the second step which is how you will fit into your home. Some units come in one piece fiberglass units and others are two or more pieces. When using a one piece it is important to note that you may have to remove several sections of metal from the exterior of the home a 2 by 4 or 2 and inside walls as well to fit the tub through the wall of the home. For this reason, we recommend tub and shower units that come in two or more pieces for ease of use when installing. 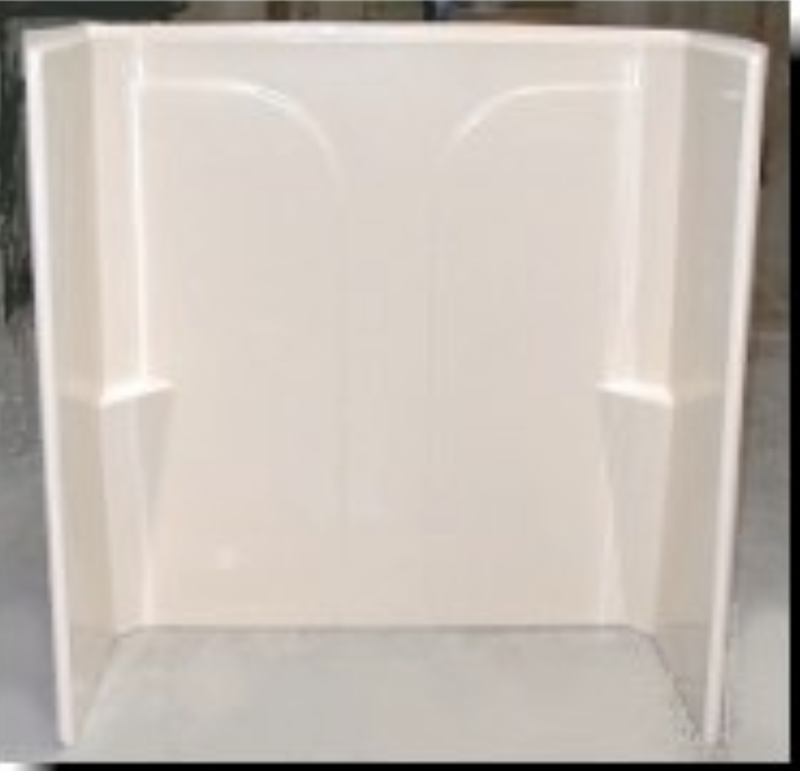 Material – When buying a tub or shower for your mobile home the main two options are plastic and fiberglass. Each has its own benefits and uses. The plastic is usually lighter and much more flexible so it’s easier to install. The fiberglass is heavier duty so once it’s installed it will last far longer than a plastic. Plastic is usually the cheaper of the two, but this is not always the case. Supplies – when purchasing a tub and shower unit is important to remember that the tub or shower will come just by itself. There are few things that you might need to get your job done and have things looking proper. Below is a list of supplies and parts that you might need to get the job done right and have it looking top-notch. If any of these are purchased and not needed at the time of installation, they can be returned with original receipt. Here are some of the more common Tubs and Showers we sell. If you are interested please feel free to Contact Us for prices and further information. This tub is most commonly found in the guest bathroom of the home. We offer it and both plastic and fiberglass and it comes in a left hand, right hand, and a center drain option. 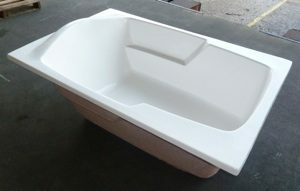 You can use three piece vinyl wall or one piece fiberglass wall for this tub size. 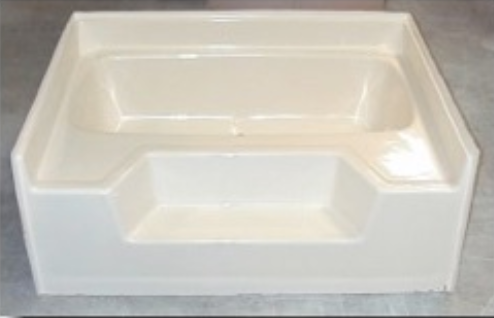 All tubs are available in both white and bone color. When upgrading from this tub people often want to go to a stand up shower unit. We do offer a Casey replacement that is a 27 by 54 stand up shower pan. This unit will be pictured below and you can use either a three piece vinyl wall system or one-piece fiberglass wall and the shower door on this unit. Pretty much any tub over the standard 27 by 54 could be thrown under the blank statement of garden tub. However when mentioning Garden tubs there two main sizes that we sell. This is a 60″ X 42″, and a 54″ X 42″. If the tub in your home is plastic, it could measure 60″ X 40″ or 54″ X 40″. The only wall option available for these large garden tubs is a three-piece vinyl walk kit. Corner Tubs – tubs with only two walls are considered Corner tubs. There are two size Corner tubs. 54 in and 60 in. 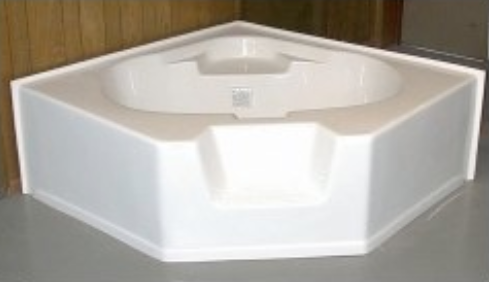 These tubs have only a two piece vinyl wall option and also come in bone or white.You also have the option of adding a whirlpool with 4 standard jets or more. 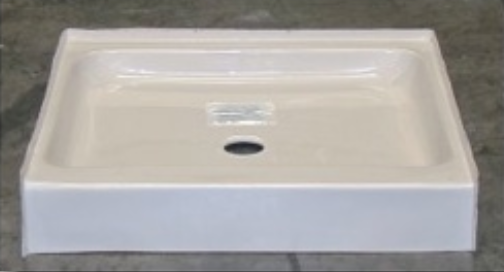 Drop-In Tub – Drop in tubs, as the name implies drop into something. Usually this is a large cabinet made of wood or some other material and the tub usually measures 60″ X 42″ and come in both white and bone color. Showers come in many sizes and styles so we will list a few of them here. However, if you do not see a style or size that fits your needs, Contact Us and we will tell you what’s available. 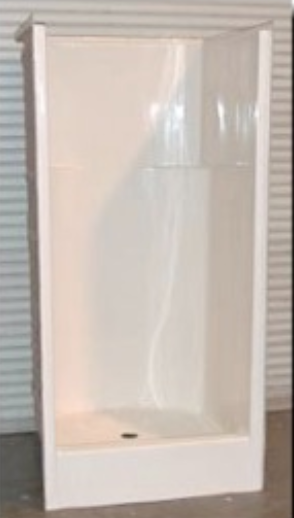 32″ X 32″ – The smallest and more popular shower stall that we sell is the 32 X 32 and it is available in a few options. Pan only – You can get just the shower pan in plastic or fiberglass. 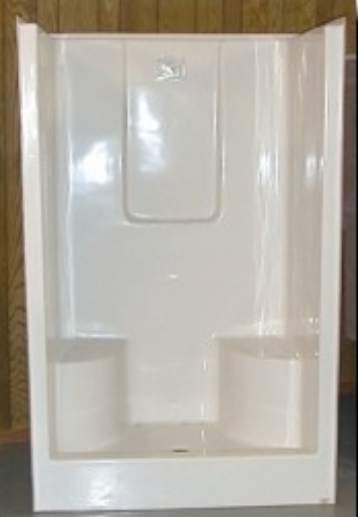 Shower Unit – You can get a base with vinyl walls, a two piece shower stall or a one piece stall. We recommend the two or more pieces for ease of installation. 36″ X 36″ & 38″ x 38″ – Available in all the options on the 32 X 32, with just a bit more room. 36″ X 48″ – Available as a fiberglass pan and vinyl wall or a Fiberglass shower stall with one or two seats in both one and two piece units. 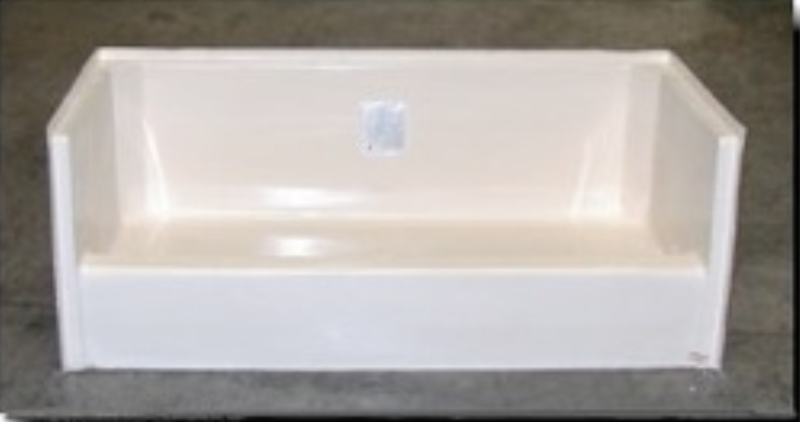 54″ X 42″ pans are available to replace garden tubs with a fiberglass shower pan.